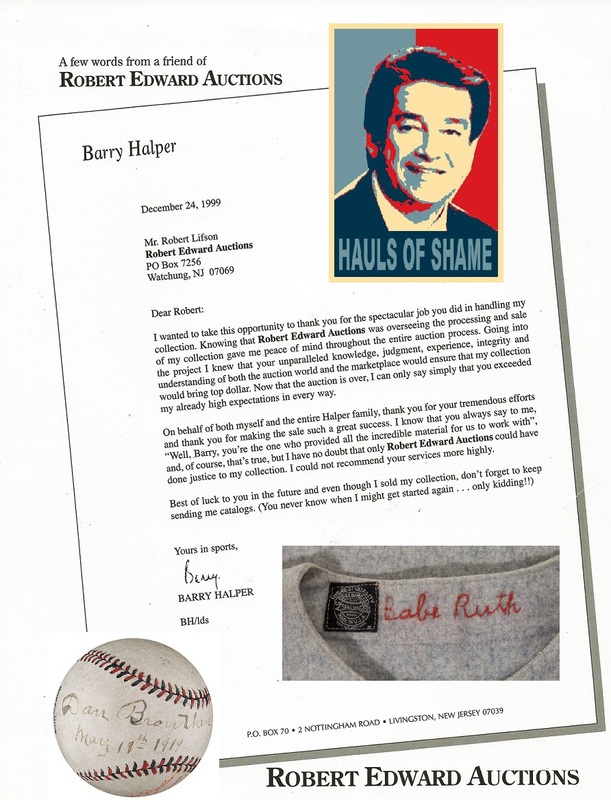 Rob Lifson includes a 1999 thank you letter from fraudster Barry Halper in his Spring catalog. The Spring auction season is upon us and the catalogs from the likes of Heritage, SCP and REA have already made their way to the doorsteps of collectors all around the country. In Dave Kohler’s SCP catalog collectors got a look at Reggie Jackson’s million-dollar jersey from the night he became Mr. October hitting three home runs in Game 6 of the 1977 World Series. They also got a peek at an alleged signed photo of the 1927 Yankees with an LOA from the family of George Pipgras. But the pinstripes on Jackson’s jersey were a dead giveaway that the jersey was not the genuine article and several experts we spoke with are of the opinion that the 1927 signed photo of the Bronx Bombers is a forgery. An alleged forgery that SCP sold for close to $300,000. SCP and Kohler ended up pulling the Jackson jersey from the sale. Chris Ivy and Heritage Auction Galleries sold a Lou Gehrig ball that we reported was likely a forgery for close to $70,000 and an alleged 1935 Babe Ruth Yankee uniform that originated from the infamous Barry Halper Collection for close to $300,000. Heritage changed its original catalog lot description online and removed all reference to Halper’s name due to the recent documentation of scores of uniform forgeries in his collection . That ploy worked well for their consignor who originally bought the jersey from Halper at Sotheby’s for $79,500. 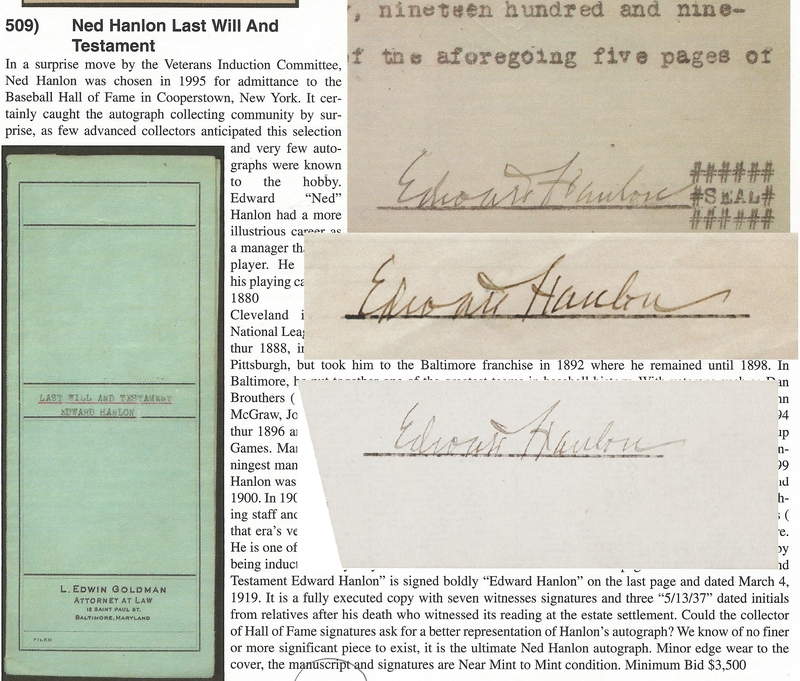 The first copy of Robert Edward Auctions’ catalog went to the Baseball Hall of Fame in Cooperstown in what REA President Rob Lifson calls, “an annual tradition.” This despite the fact that one ex-Hall official has confirmed that Lifson was banned from the Hall’s National Baseball Library with his name appearing on an internal watch-list containing the names of known institutional thieves. Lifson was apprehended stealing rare CDV photographs from the New York Public Library’s Spalding Collection in 1979 and has been linked to the sales of numerous stolen artifacts that once belonged to his former mentor, the deceased New York Yankee partner and collector, Barry Halper. It is Halper who has been identified by a source prominent in baseball circles as the self-admitted mastermind behind the multi-million dollar heist from the library. The Hall of Fame is all-too-familiar with Barry Halper and his once celebrated collection having been victimized to the tune of several million dollars after purchasing counterfeit and misrepresented artifacts from him in 1998 including fakes attributed to “Shoeless” Joe Jackson, Mickey Mantle and other baseball legends. One would think Lifson’s inclusion of Halper’s letter would raise a few eyebrows in Cooperstown considering the Hall has removed the “Barry Halper Gallery” space from the museum after the magnitude of frauds perpetrated by him were uncovered and exposed by Haulsofshame.com in 2010 and 2011. While Lifson includes the letter of praise from Halper in the catalog, he is not as quick to reveal a Halper provenance on items being offered for sale in the current auction. 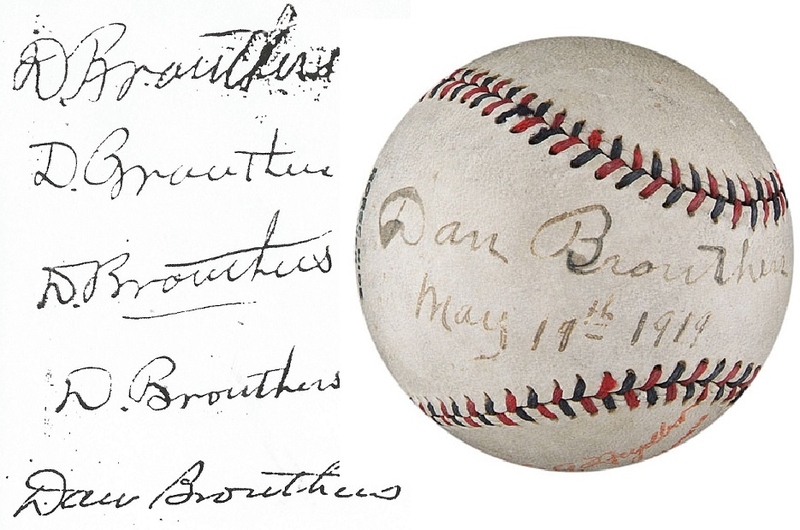 Case in point is Lifson’s offering of what is described as a rare single-signed baseball of 19th century Hall of Famer Dan Brouthers. Nowhere in the lot description does Lifson mention that the baseball originated from the Halper Collection and that he actually sold the ball for Halper in the early 1990s for close to $20,000. The Dan Brouthers signatures illustrated to the left are housed in the Baseball Hall of Fame's Long Papers Collection (the top two are believed to have been signed by someone other than Brouthers). The signatures are written on endorsed and cancelled paychecks from the Boston Players League team in 1890. The signature at the bottom is from a 1917 letter written by Brouthers that was donated to the Hall of Fame. I know about the Halper provenance because I’m the person who purchased the baseball from Lifson and Halper believing that I was acquiring the genuine article once held in the hands of the 19th century batting champion. This alleged Dan Brouthers pencil signature was executed on the 1890s ledger pages from the Barry Halper Collection which sold for $92,000 at Sotheby's in 1999. The Brouthers signature and all of the other signatures signed in pencil on the ledger pages are believed to be non-genuine and added at a later date, while the ink signatures appear to be genuine. Hamilton did not have the opportunity to study the illustrated authentic Brouthers exemplars that have been made available recently via the Baseball Hall of Fame’s Frederick Long Papers Collection, which includes numerous Boston team payroll checks endorsed by Brouthers. In addition, the Hall also has in its collection an authentic 1917 handwritten letter executed by Brouthers as the manager of a semi-pro club in Brooklyn, NY. Of course, the REA Brouthers ball is accompanied by a Jimmy Spence/JSA LOA just like another highly suspect offering by Lifson which he claims is an authentic baseball signed by Hank O’Day, the newly elected Hall of Famer and umpire. 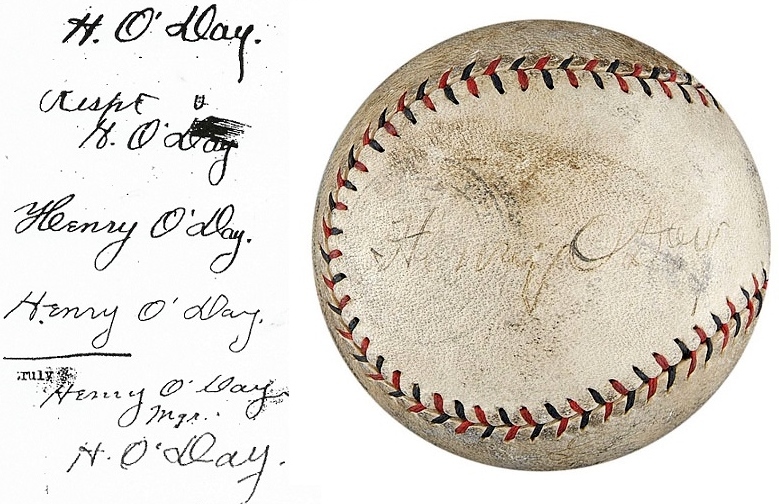 This alleged Hank O' Day baseball bears little resemblence to the six authentic O'Day signatures found in the HOF's Herrmann Papers Archive ranging from 1902 to 1921. The ball also features what is described by REA as a secretarial signature of Babe Ruth and another of Cincinnati Red player Mike Mitchell. 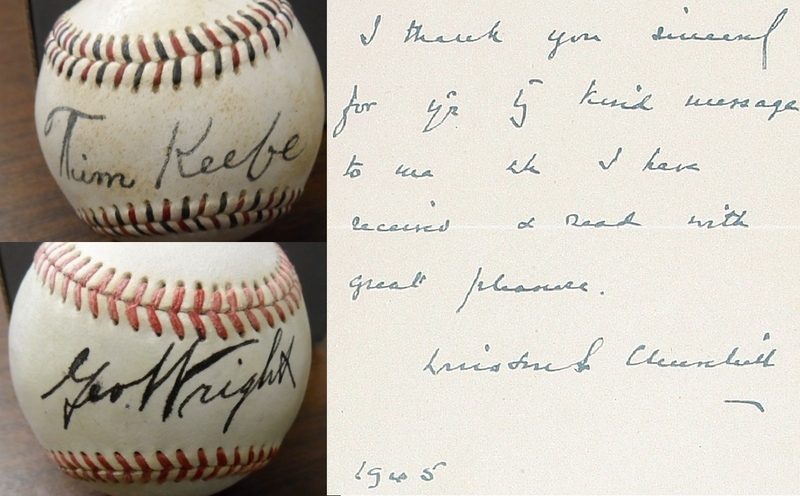 The Mitchell signature appears to be the only authentic scrawl on the ball when compared to other authentic versions of his signature originating from the August Herrmann Papers Collection at the Hall of Fame. Considering the Ruth and O’Day names written on the ball do not resemble the authentic signatures of the two Hall of Famers it is much more likely the ball is simply a Mike Mitchell signed ball with the names of Ruth and O’Day written on it for some reason. REA erroneously claims the Ruth signature is written in another hand and just assumes that the alleged O’Day is genuine based solely upon JSA’s flawed opinion. 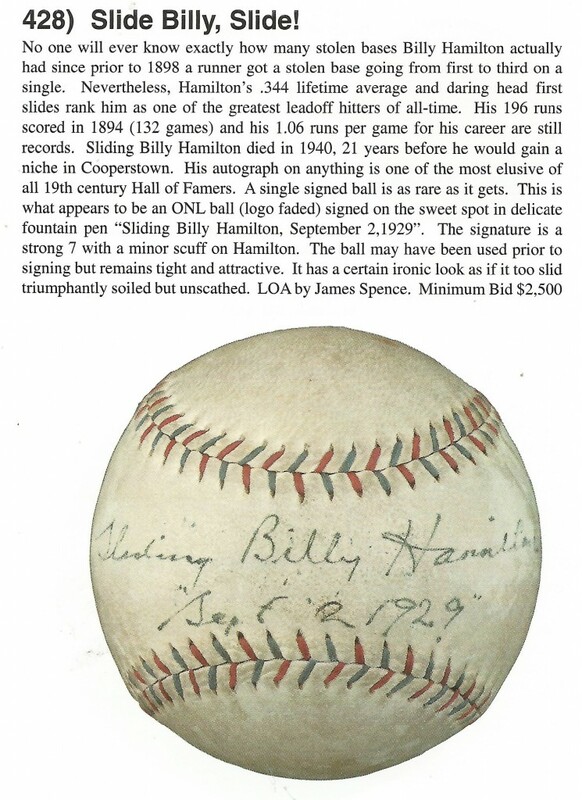 “….Hamilton has signed the ball “Sliding Billy Hamilton” in black fountain pen across the sweet spot, directly below which he has added the date: “Sept 2 1929.” Both the signature and date grade “8″ overall; however, each has been professionally enhanced. That fact was revealed when James Spence Authentication examined the ball under a video spectral comparator, which allows for the observation of latent writing and/or markings. It is important to note that James Spence Authentication has deemed the Hamilton signature authentic, but it must be properly qualified with regard to the enhancement. Normally, such enhancements are vintage in nature, done by an early owner to help preserve a fading signature. Not so with this example! This ball was professionally enhanced during the late 1990s and we did not need a video spectral comparator to come to that conclusion. We know this because Robert Edward Auctions originally sold this very ball in our September 8, 1994, auction. At that time we duly noted the condition of the signature in our catalog description: “Signature grades only a “4″ or a “5″ due to general wear but is clearly and entirely legible.” In particular, the central “Billy” portion of the signature was badly worn and faded, much more so than any other part of the writing. The next time we saw this ball was a few years later, when it was offered by another auction house, only now the signature had miraculously improved. After a few inquires, we later learned that the original purchaser of the ball from our auction had the signature professionally enhanced for aesthetic reasons. Our consignor purchased the ball at that auction and it has remained in his collection ever since. When Mastro sold the Billy Hamilton single-signed baseball in 1998 there was absolutely no mention of "enhancement" in the lot description. When the exact same ball appeared in a Mastro Auction in 1998, four years after it originally sold at REA in 1994, there was absolutely no mention of the ball being “enhanced for aesthetic reasons.” Jimmy Spence also authenticated the ball for Mastro in that 1998 sale. The "enhanced" "Sliding" Billy Hamilton baseball is shown in its "before & after" states in a 1994 REA auction photo (right) and today in the 2013 REA catalog (left). The extent of REA’s so-called enhancement, which improved the visibility of Hamilton’s alleged signature, is quite striking when compared to REA’s original photo of the same ball from its 1994 auction. Why didn’t REA include the photograph of the ball from when it appeared in its 1994 auction? Perhaps REA didn’t want bidders to have the opportunity to see the level of “enhancement” administered to the ball. More importantly, who actually enhanced the ball in the first place? Was it the same person who “enhanced” the now infamous Harry Truman ball that was exposed by Hauls of Shame last year? These photographs are of the same single-signed Harry Truman baseball. On the left is how it looked when it sold at MastroNet in 2001. On the right is how it appeared at EAC Galleries in 2005 as the "finest example extant."" When did the concept of enhancing single-signed baseballs come into vogue? Who enhanced the Hamilton and Truman balls? The same goes for REA’s alleged Frank Chance and Roger Bresnahan single-signed baseballs which JSA says were enhanced as well. In 1999 Jimmy Spence authenticated both balls for Mastro without any mention of enhancement. An expert we consulted with went a step further and identified both signatures as outright forgeries. So, is there now a new market for graded and enhanced fakes too? REA and JSA say the single-signed balls of Frank Chance and Roger Bresnahan are enhanced, but experts are of the opinion they are fakes. REA fails to disclose that late expert Charles Hamilton deemed the John M. Ward ball REA is selling was a forgery. Lifson and REA also fail to disclose that the alleged John M. Ward single-signed mini-ball they are selling was deemed a forgery by late handwriting expert Charles Hamilton back in 1994. (Hamilton had numerous genuine Ward signatures as exemplars when he gave his opinion.) REA also fails to disclose that this same ball sold in a 1999 Mastro Fine Sports Auctions sale with LOA’s from Jimmy Spence and Mike Gutierrez. At the time Bill Mastro told this writer, “I had to twist Jimmy Spence’s arm to get a letter on that one.” I have first hand knowledge of this ball because I originally purchased it from an associate of Barry Halper for over $20,000 in the early 1990s. The episode featuring the Ward ball is a good example illustrating how auctioneers like Lifson would shop for opinions of so-called experts like Spence to say an item was genuine, despite the fact that a well-known expert like Hamilton had already deemed it a forgery. Ironically, Spence later authenticated the same ball and also lied under oath in court depositions stating that he had actually studied and worked with Charles Hamilton. In reality, Spence had only visited Hamilton on a few occasions accompanying a collector who was dropping off materials to Hamilton for authentication. Speaking of fakes, we can’t forget REA’s other lots alleged to be forgeries by experts including the inscribed Babe Ruth photo to Gary Cooper and the 1933 signed Babe Ruth Goudey baseball card. Six other Ruth signed photos (and several others alleged signed by Ty Cobb and Honus Wagner) were withdrawn from the auction after being called out as fakes, but REA says the lots were withdrawn at the request of the consignor, not because they were counterfeits. 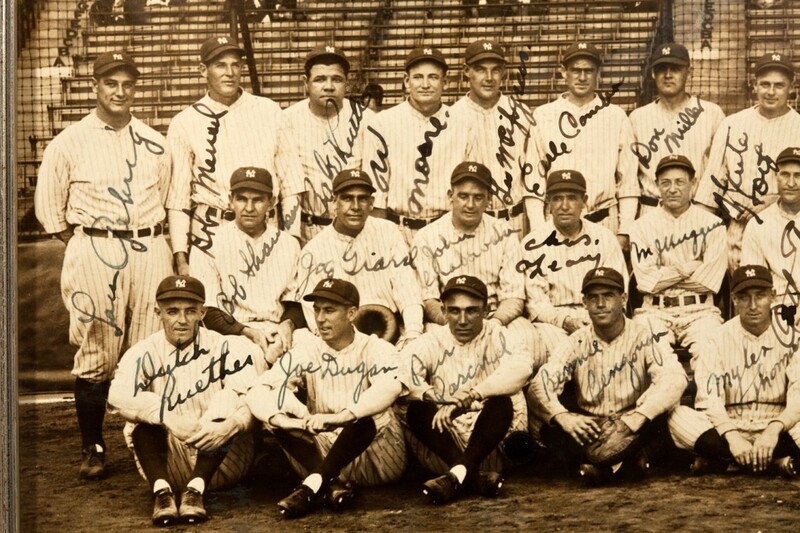 How can Spence consider himself capable of authenticating non-sports signatures when he clearly has more than enough trouble identifying genuine Babe Ruth autographs? Experts consider these alleged single-signed balls of the HOF's early Induction class to be non-genuine. The alleged Jim Bottomley ball certified authentic by Jimmy Spence and JSA is included as an example of one of the worst forgeries ever to get a Spence LOA.. Experts confirmed their opinions that the above referenced “Sucker’s Dozen +3″ was chock-full-of-alleged-fakes (over $250,000 worth). How the TPA’s and the alleged expertise of Steve Grad and Jimmy Spence could let these alleged forgeries to creep into major sales is remarkable. If they can’t get Ruth, Cobb, Gehrig, Young and Wagner right what confidence can collectors have in the LOA accompanying their own “certified- authentic” items? Recent Tim Keefe and George Wright forgeries offered by Coaches Corner are just as authentic as a Winston Churchill offered by REA with a Spence LOA. JSA couldn't tell that the Churchill letter was a mass-produced facsimile copy. Are your LOA’s in the league with Jimmy Spence’s expert opinions on Winston Churchill and the Babe Ruth to Gary Cooper embarrassment? Some would say you’d be better off buying some Tim Keefe or Amos Rusie signed balls at Coaches Corner. Fakes are fakes no matter who is selling them. The Matty Won in the Ninth secretarial signatures from HA and REA are pitted against a genuine signature from Matty's 1912 Pitching in a Pinch (also for sale at REA). REA uses a 1910 Mathewson letter (bottom) to support the Won in the Ninth inclusion in its Spring sale. 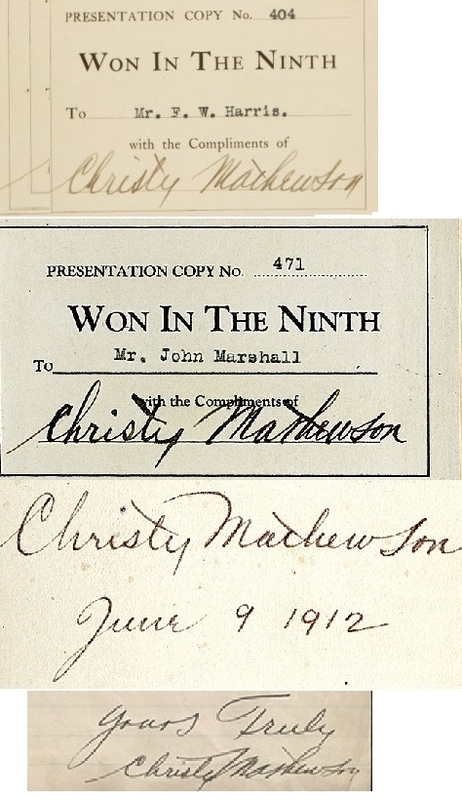 Returning to the Spring sales were the much-maligned secretarial-signed Christy Mathewson Won In The Ninth books. Heritage sold one for close to $9,000 while REA has a current bid of $4,750 on a Matty fake and $6,500 on a genuine Matty signature featured on a 1912 copy of Pitching In A Pinch. Expert Ron Keurajian has stated in articles and in his autograph handbook that the signed bookplates in Won In The Ninth were not executed in Mathewson’s hand. REA and JSA, however, are hanging their hat on a 1910 Mathewson letter sold by Hunt Auctions that they claim shows similarities to the bookplate signatures. Keurajian disagrees with that opinion and it is important to note that the Mathewson secretarial signatures were attempts to mimic Matty’s actual signature. That is why there are similarities between the examples in question. This time around the major auction houses had surprisingly few items believed to have been stolen from major institutions. We were most surprised that there weren’t any August Herrmann-related documents included in the sales. Ned Hanlon's will was stolen from a Baltimore Courthouse in the 1990s. The will was recovered and bears Hanlon's autograph on a typed signature line. It is believed that other signed probate documents were stolen from the Hanlon file and clipped for "cut signatures" like one sold by Clean Sweep auctions (middle) and Heritage (bottom). Oddly enough, Hanlon’s last will and testament and other probate documents were stolen from a Baltimore courthouse in the early 1990s and the will was offered by Mastro Auctions in 2000 before the FBI stopped the sale. It is believed that other “cut signatures” were clipped from additional pages executed by Hanlon that were not recovered by the authorities. One such Hanlon “cut signature” appeared in Steve Verkman’s Clean Sweep auction in 2009, and another just sold at Heritage for $6,572. Actually, it is more likely it was clipped from a legal document in his probate file that has been documented as having been stolen from the Baltimore Probate Court. The Hanlon signature on the will appears to have been written above a similar black signature line created by a typewriter. The illustration featured above speaks volumes about the Heritage offering, which included no information related to the provenance of the item. Jimmy Spence of JSA and Steve Grad of PSA/DNA have authenticated scores of signatures on documents stolen from institutional and municipal collections. At least they know for sure that these signatures are actually real when they issue their LOA’s. It’s easy money for the big-time TPA’s endorsed by eBay and virtually every major auction house. From Halper right on up to today, they are and were. all thieves and have to be stopped, cause enough of good $,s has been spent for worthless junk. Any one who bids etc. on anything that came out of the Halper collection alone, has to be a fool.It is almost like how many times that big bridge in NYC has been sold !!!!!!!!!!! Thank you for your continued excellence in reporting these matters. It’s really a shame of all the thievery and lies involved with vintage signatures. These so-called authentication companies really need to be called out and regulated. JSA, DSA, PSA, DNA,LOA. It’s getting to sound like a song Pete! It would be funny if it was not so serious. What’s next? I would like to know the classes these “experts” took to be so credible? There lies the problem. Collectors smarten up. Just because you get a LOA (which can be printed anywhere) does not make it real…only in your collecting mind. Barry Halper has to be laughing right now, knowing people shelled out good, hard earn money, thinking they were getting on the ground floor of baseball history, and find they got taken to the cleaners. Barnum was right. I find it fascinating how many of these new-looking, lilly-white 70+-year-old autographed balls have appeared over the past decade. 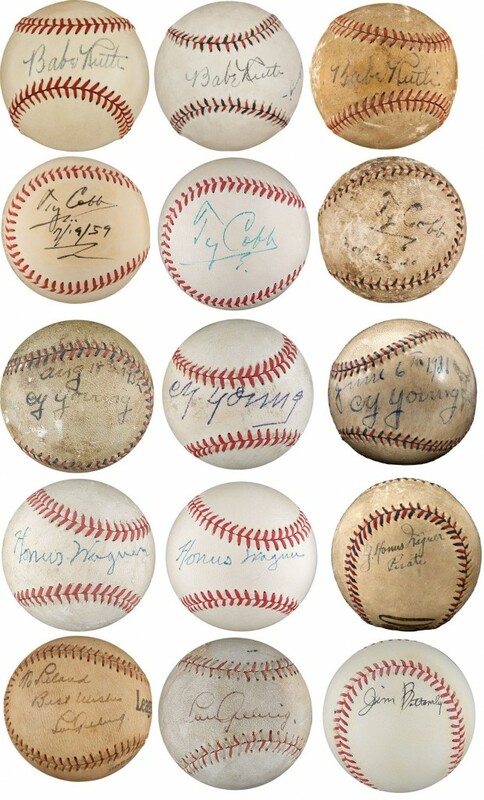 Anyone who has collected autographed balls over the past few decades can tell that 99% of these are either fake or have been altered in some way – old baseballs simply don’t age this way, and people back in the 1920s and 1930s didn’t store autographed balls in plastic ball holders the minute after they got the signature, as people do today. So, how are people executing these fakes? Are they finding old baseballs at garage sales and getting them polished up? Or are the baseballs themselves fakes? I would like to see one of these balls – such as the Chance or Bresnahan above – cut open to see if the insides are vintage, or are of recent construction. If forgers in China can make old U.S. coins that can fool collectors, anything is possible. As reported by Haulsofshame.com last year, these blunders have caught the attention of the Federal Bureau of Investigation and agents are well aware of the questionable authentications of Spence and PSA for millions of dollars worth of alleged fakes ranging from gem-mint Babe Ruth signed baseballs to the recently exposed 1939 Hall of Fame Induction forgeries uncovered by Hauls of Shame and several hobby experts. Spence’s shoddy work and expensive errors are being exposed at an alarming rate and continue to dog the so-called expert who still has the blessing of eBay and every major auction house in the business. The Honus Wagner signature debacle perfectly illustrates the problems with third-party authentication and the slippery slope that authenticators like Spence rest upon. At what point are their errors considered “honest mistakes” and at what point are they scrutinized for possible “criminal intent”? In the 80’s I was buying lots of memorabilia from ads in Collector’s Digest. Also from a monthly auction ( Teletrade). I’m pretty sure most of the stuff I collected is fake. Looks good in my man cave. My boys will probably have to either keep or destroy most of my collection since they won’t be able to sell it. Shame on me. Oh well. Herman, Thanks for responding. It is a rare opportunity for insight into an authentication. I think we all agree, that on any purchase of such magnitude greater diligence is required. Rick, should have at least called you, googled you, (asked a guy on the street, for god’s sake) rather than just saying “I never heard of this guy.” I have a question for you on your authentication of this item. how much did the story of who, why, and how this was signed weigh on your decision? I ask this in reference to the erasure, and as importantly, the Shoeless inscription. Under what circumstances do you feel someone would feel the need to clarify a plainly obvious signature, especially on a book referencing that individual? As far as the erasure, are there other examples of such behavior? This would have had to have been witnessed, noted, and related to someone in order for it to be considered with great weight, would it not? From whom did you receive these bits of info? I ask these as common sense (to me) issues that I would have asked the authenticator if I were in the position to purchase such a rare artifact. Jim Marinari PS. The intelligence or lack therof of forgers can be easily debated in another thread. I have seen a Gehrig signed in sharpie.